A huge sorry for the lack of updates. Just been too damn busy with work, rugby and life in general. The Hopefool's made the final and unfortunately lost in the last few minutes 18 -17. Had our end of season trip to Napier (didn't get to see Meeanee) and had a great time. 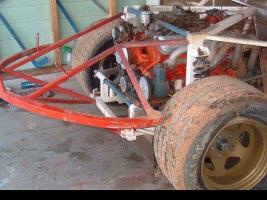 The race car is just awaiting an engine, a rim and a couple of tyres. Practice days have been a washout and with opening night only a couple of weeks away I am not confident of being there...BUGGER! 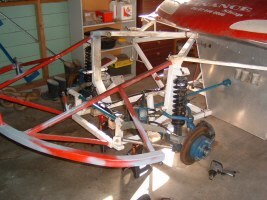 I have had time to kill so I have been mucking around with the steering. I have been using Torana steering arms, on the hub's, but have found that they are prone to bending with even light touches. So I have replaced them with "short" HQ arms and beefed them up a bit. Should be good now. I have also repaired all of the panels. Man I hate fibreglassing and bog!!!!!! I hope to be ready for 1 Nov at Huntly, the Fireworks Extravaganza, and if the track is as good as it was on opening night, I hope to put in some fast times. Just have to put it all back together now and put it back where it belongs. Won't be at the Fireworks extravaganza on Saturday night, at Huntly, but I will be ready for the 15th November. Finally some progress is being made. I painted and put the engine back together over the weekend. Last night I put it back in the car. 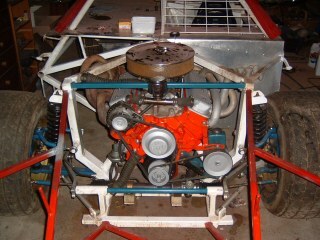 Tonight I am fitting the headers and getting the motor ready to fire up tomorrow night. Almost a week later and the engine is in, and every thing is all connected. 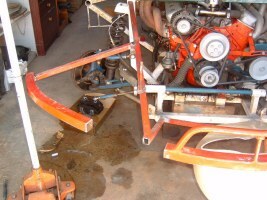 Unfortunately an oil leak was found when starting the engine for the first time. Have to fix that tomorrow night. Body is all back on, only the bonnet needs finishing off and painting. Just need to do a set up on the car and we will be all go for this weekend. FINGERS CROSSED! See you at Huntly on Saturday night and/or Kihikihi on Sunday. Well, a weekend, on the track, I would rather forget....Saturday night Huntly, Sunday Kihikihi's opening meeting. Finally got the car ready and on the track. New engine is awesome, but the driver has got to learn to drive again....far too long out of the drivers seat. Next meeting 29 November at Huntly. Well repairs have been started and as per normal the damage was greater than first thought. Thanks to Nick McDonald for some structural welding. Only have bumpers to straighten now and we will be all go again for the 29th at Huntly. 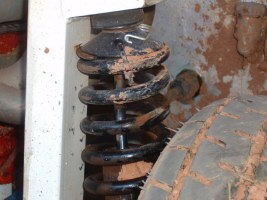 Shock bent and broken A-arm mount. Bumper did it's it job!!!! 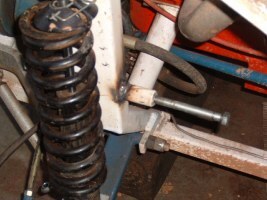 Shock Replaced & A-Arm mount re-welded. Sorry for the appearance of no updates....I haven't been able to get the site uploaded for some reason that I am unaware of. What an awesome nights racing at Huntly!!!! Why wasn't I there???? 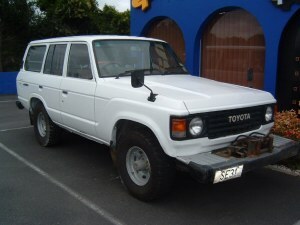 Well, I purchased a 1985 Toyota Landcruiser which needed a little work to get a WOF and rego. Achieved that on Friday, finished off the race car Saturday morning only to then find most of the fuel had leaked out and with no $$$ left, she stayed in the garage while I went and watched. BLOODY FRUSTRATING TO SAY THE LEAST!!!!! I am now down to NO SPARE TYRES and am 3 spare rims short. So will be a while before I am back in full racing mode. On the positive side. All repairs made. New engine performing well. Website host, Tripod, have canned the free websites....and didn't tell ANYONE!!!! This is why the lack of noticeable updates. Hopefully I am back on track now. Saloon points will be updated soon. Just back from an awesome display of Super Saloon driving at Huntly for the Waikato Super Saloon Champs. Congrats to Steve Williams on taking the title, Lance Jennings for 2nd and Mike Pegler for 3rd. I have updated the Saloon Points and archived last years What's Up...? pages. 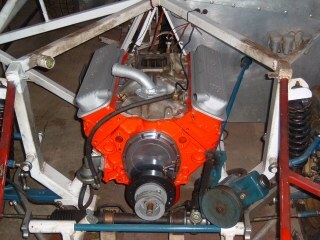 Carb is still away being repaired and should be ready next week. Another awesome nights racing at Huntly, but not for me! Check out my results and newsletter. Merry Christmas to everyone from the NLW Racing team. 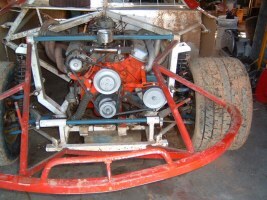 Due to a major lack of funds and the minor damage received, I have decided to park the car up for the rest of the season and make a few chassis alterations. This car now has more horsepower than I have ever had and I need to get the set up better so I can get some laps in and learn to drive the bloody thing again! After all, I am racing for fun and the thrill of it, NOT TO BE THE WORLDS GREATEST!! I will make periodic postings as to the progress of the alterations and wish ALL the Huntly Saloon Drivers well for the rest of the season. I will keep the points up to date as I get them. After putting the car up on blocks, taking the wheels and body off, I found that the panard bar mount on the diff has snapped. It hasn't let go, but would have been flexing. 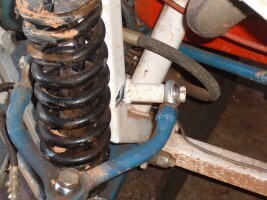 Another major contributor to the poor handling was in the setup. I had too much weight on the left rear. After having things explained in "Nigel" english I now know where I went wrong there. I will be switching the panard bar over and redoing the torsion's. 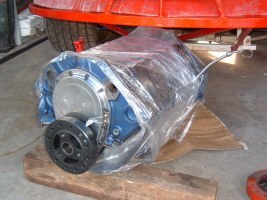 A birdcage will be fitted to the diff to enable everything to work properly. Currently, the system will bind up after limited movement. We need more movement!!!!! Oh well, that is the sad news. Front of the car has been repaired. Just need to weld in the new bumper segment. 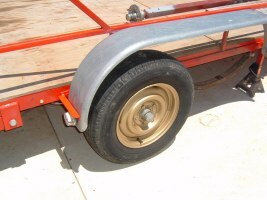 I also had the rear axle on my trailer widened, thanks Barry, and I then shifted the whole setup back 5 inches to see if that will balance the trailer better. I have acquired a couple of rear tyres and a new right rear rim has arrived from Addis Containers. I hope to be back out again on Sunday the 25th of January at Kihikihi. I have also made some amendments to my results and last newsletter. Well, I have finally removed my head from up my backside and have the car all repaired and ready to go. 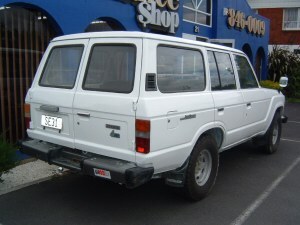 I will be heading to Kihikihi tomorrow to test her out. I will be starting half a lap down to ensure I can get some laps in and be ready for the big double header next weekend. Waikato Champs Saturday night at Huntly and King Country Champs Sunday at Kihikihi. Disappointing turnout, only 5 cars, on a beautiful, hot Waikato day. All in all though a very successful day, with 24 races in all. I can happily say my practice session was a great success. 3 races started, 3 races finished and NO DAMAGE....YIPPEEEEEEE!!!!! Ran off the rear, by half a straight length, in all 3 heats and the car handled fantastically. Check out the newsletter and my results for more info. I look forward to next weekend now, with excitement. The weather beat us today and so the Waikato Saloon Champs have been postponed until next weekend. Doesn't look promising for Kihikihi tomorrow either. Car is tucked away in the garage all ready to rock & roll. Not a lot of comment in the Guest Book???? Kihikihi managed to get a full meeting in despite the weather threatening all day to put a stop to it. Not the best day at the office, but we finished all 3 races. Check out the newsletter and my results for more. Car is ready to go for tomorrow nights Waikato Saloon Champs. Looks like another good number of cars entered, so should be awesome. Well, last Saturday night was just plain awesome. The best Ltd Saloon racing I have seen in a long, long time. It was very, very fast and clean as a whistle. Unfortunately I stuffed up when leading my second heat race so I didn't qualify, but all in all I had a great night. I will fill out the Waikato Ltd Saloon Champs page after I can get my hands on the final placings sheet. Have finally updated the complete listing of finalists and placings for the Waikato Ltd Saloon Champs. One of the reasons why I am so broke this season, my new tow vehicle. Thanks to Waikato Sandblasting for the tidy up.